After 87 issues we now close the door on a new team of new mutants led by Jubilee. There were many mighty highs and only a few brief dips in quality during the writing tenure of Christina Strain, but things really started going downhill when that hotshot fan favorite artist took over as both artist and writer. What editor thought it would be a good idea to militarize the group and add some random Terminator knock-off from the future as a leader? Oh wait wrong new mutants. In fact Christina Strain told a great story in her all-too brief 12-issue run as writer on a new iteration of Generation X, which comes to an end with this re-numbered issue 87. This issue does a fantastic job closing the story arc for a number of characters and ends on a satisfying note, for now. Just to clear any confusion the numbering for this issue comes from Marvel’s Legacy numbering that they’ve been doing on all their books lately. The original series was cancelled in 2001 with issue 75, and this is the conclusion of 12 additional issues bearing the name Generation X. By the end of this series we even catch up with the remaining members of the original team, who come help out the newer characters to take on M-Plate, a villainous merger of the character M and her brother, the OG Emplate from all the way back in the original Generation X #1. Warning: there will be spoilers from here on out. First of all is the big update for longtime X-fans: Jubilee got her powers back! No matter what your take on the character is it’s hard to argue that her turning into a vampire was pretty stupid. I’ll go even further and say that the whole House of Mevent that depowered her initially was stupid. As the star of the mutants rises again post Fox/Disney merger it seems like Marvel’s mutant-clearing goals with that series are beginning to be erased. I’m glad they went in this direction because Jubilee is a character that’s actually aging and developing as a character, unlike many of the legacy mutants who have been stuck in a holding pattern since the early 90’s, or killed/brought back/sent back in time etc. Jubilee’s students also reach satisfying conclusions in their stories. Bling! is ready to go back in the world with a more positive outlook on life, a 180 from where she was at a the beginning of the series. Morph and Hindsight fall in love, Kid Omega is rid of the Phoenix Force, and Eye-Boy and Nature Girl continue to develop their relationship. Not too shabby for a group of misfits among a larger group of outcasts. And hey, M is no longer under the thrall of her evil brother, while Chamber and Jubilee reach a new phase in their relationship. Husk and many other great X-characters not on the A-list also dropped by and said hi over the course of this series. 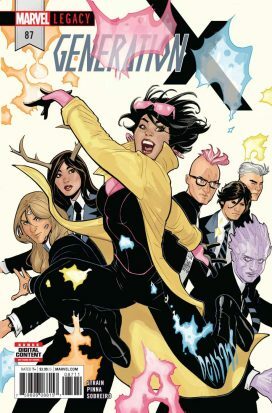 Out of all the “ResurrXion” books this one was definitely my favorite, possibly because it was doing something a little different, and telling new stories with a cast that’s half familiar, half pretty much brand spanking new. It’s funny because Christina Strain was the colorist on Runaways, another favorite book of mine about teens with superpowers, and while she wasn’t the writer on that book sensibilities from it have crossed over into this series, one that is colorful and pops, much like a certain mutant firecracker named Jubilation Lee. The artwork by Amilcar Pinna adds greatly to the unique vibe of the series, and I enjoy his design choices with the various characters that manages to compliment and sometimes contrast with their distinct personalities, like Hindsight’s finery, Eye-Boy’s hoodie that conceals his deformity, Quentin “Kid Omega” Quire’s punk aesthetic and Nature Girl’s uniform in contrast with her many animal friends. New Mutants made it to 100 issues in its original run, Generation X to 75. I love both of those books for presenting new characters and situations in familiar settings like the X-Universe and Xavier’s Mansion. They both lost their way after a while though, and if the future of the B-list and below X-Men characters are smaller 12-20 issue runs then so be it. Have a focused creative team tell the story they want to tell with a certain amount of issues, not many different ones over an insane amount of issues. What I don’t want is for these characters to be shelved forever, sitting in limbo like that weirdo Emplate. Strain and Pinna did good things with this run, here’s hoping for more. Last month, I picked up Old Man Logan # 34 on a lark. I was feeling nostalgic for a Wolverine solo comics so I thought I’d give the new old ol’ canucklehead a shot. Ed Brisson’s a solid writer and Matteo Buffagni’s art looked great, so what did I have to lose? I dug the story and snagged # 35 the following week. Ibraim Roberson replaced Buffangi and he did not disappoint. This week, I picked up Old Man Logan # 36. Old Man Logan returns to New York to find the people of NYC elected Wilson Fisk, the Kingpin, as their mayor. First off, there’s a different artist on this issue, Dalibor Talajic and I dig his work just as much as I have the Buffagni and and Roberson’s. The previous two issues took place in Logan’s old stomping grounds of Madripoor. This new arc, “Moving Target,” drops Logan right into the dizzying lights of New York City’s Times Square. Talajic captures the frenetic energy of LED-soaked tourist trap. Naturally, Logan ducks into the darkest corner he can find to have himself a Molson. The story follows some familiar beats. Logan laments Fisk being elected mayor may be a sign of his nightmare world coming to fruition in the Marvel Universe. A stranger approaches Logan in the bar, desperate for the the former Wolverine’s help. See, this kid worked for Wilson Fisk and swiped an encrypted thumb drive the Kingpin almost never let out of his sight. Thing is, this isn’t the Wolverine of the ol’ Marvel Universe, this is Old Man Logan – a man from an alternate timeline where the bad guys teamed up and killed all the superheroes. Also, his healing factor is about as slow as molasses in January. Brisson and Talajic keep the story moving with some action-packed panels. When Logan gets his hands on the thumb drive, his source is killed. 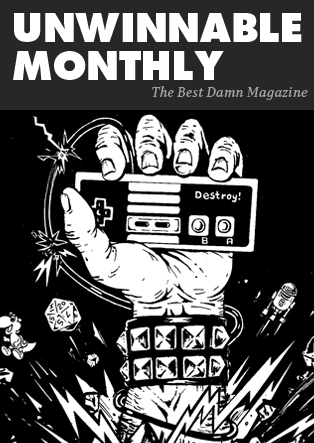 Naturally, Logan gets into it with Fisk’s goons on the subway, ending with one goon getting crushed by a train and Logan making an impromptu visit to the nearest Duane Reade before figuring out his next move. Logan’s muted healing factor adds a sense of mortality that Wolverine was missing for a long time. He’s older, he still slices and dices and he still has the healing factor, but he can’t take the hits he used to. After getting shot in the back a few times and taking some heavy hits, Logan has to patch himself up after bleeding all over the pharmacy. Brisson has the same writing chops as Peter David, Jo Duffy, Larry Hama and numerous great Wolverine writers. His stories bridge crime, action and superhero genres in ways the best Wolverine stories do. 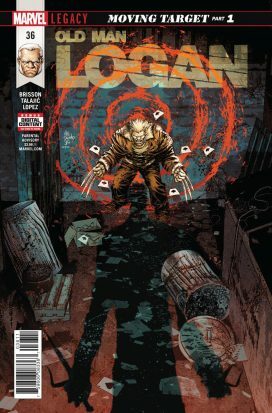 This issue, Logan barely made it through an encounter with some nameless thugs, how is he going to survive going toe to toe with Bullseye next issue? I’ll be checking in with Old Man Logan # 37 to find out.